Ann S., born and raised in Aesthetic Realism. The book offers conclusions on how to deescalate the cult dynamic in society. Nori Muster has a master's degree in abuse counseling from Western Oregon University and helped to uncover systemic child abuse in the International Society for Krishna Consciousness (ISKCON). 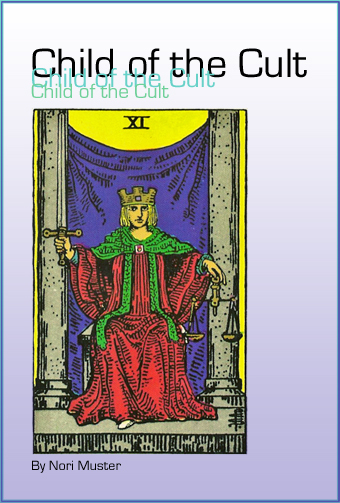 Child of the Cult is the result of more than twenty years of research. Muster's challenge is to draw attention to an almost insurmountable problem: How do we stop harmful and dangerous cult behavior? How do we prevent folks from joining a deceptive group or dangerous cult? What exactly is a cult? In Muster's view, this seems to be a problem that includes a syndrome that has no established name. We use terms like brainwashed, hypnotized, mind-controlled, conned, duped, deceived, manipulated, influenced, and charmed or enchanted. We add phrases like thought reform, behavioral control, bounded choice, left-handed path, gas lighting, Stockholm syndrome, battered wife syndrome, authoritarian rule, charismatic relationship, and under a spell. To name is to limit the problem that includes a host of social interactions under religious, secular, martial, political, therapeutic, transcendental, or financial guises. Yet attempts have been made by professionals to define it. Muster parses harmful cults to mean "authoritarian networks that form around dangerous people who portray themselves as spiritual leaders." . . . This book is a good overview of the problem, whatever you want to call it, and a noteworthy plea for society to pay more attention—we ignore dangerous cult activity at our own peril and that of our children. Click here to read the entire review at Szimhart's site. Child of the Cult paperback.